Product Advantage-Advanced Solar Power (Hangzhou) Inc.
ASP S1, S2, S4 series CdTe thin film modules have a high efficiency and a proven-excellent record on power generation performance. Comparing to crystalline silicon solar module, CdTe thin film module generates 5-10% more in average of electricity every year. Cadmium Telluride is a semiconductor compound with a high absorption coefficient - 100 times higher than silicon. The band gap width of cadmium telluride is more suitable for photovoltaic energy conversion than silicon. To absorb the same amount of light, the thickness of cadmium telluride film is only one hundredth that of silicon wafer. 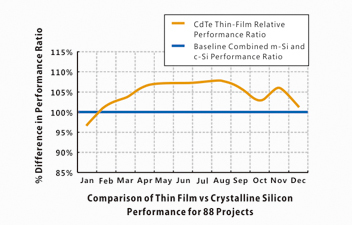 Today, the world record of cadmium telluride thin film conversion efficiency has reached 21% in the laboratory. And the CdTe thin film solar module with dimension of 1200mm * 600mm produced by Advanced Solar Power (Hangzhou) Inc reaches to 12% and above on conversion efficiency. The S1 and S2 series products have obtained TUV, UL and CQC certifications. The temperature coefficient of ASP CdTe thin film solar module is only about -0.21%/℃, as the traditional silicon solar module temperature coefficient reaches to -0.48%/℃. For most of high solar irradiance regions on earth, the temperature of solar module at working can reach to 50℃ or above. 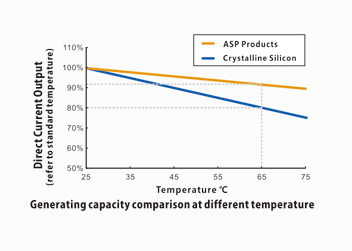 Thus this fact have greater impact to the conversion efficiency of crystalline silicon solar modules than to ASPʼs CdTe thin film modules in real-life power-generation. Cadmium telluride is a direct-band-gap material with high absorption for the full spectrum. Under low-light condition, in dawn, dusk of a day or in a diffuse lighting, the power generation performance of CdTe thin film solar module has been proven to be higher than that of crystalline silicon solar module which is made by an indirect band gap material. No intrinsic light-induced degradation effects. The elongated cells of CdTe thin film module help to reduce the hot spot effect of module, which leads to a great advantage of improving the power generation capacity, ensuring the safety in usage and product life. Contributed by a proprietary technology adapted in ASPʼs CdTe modules manufacturing process, ASP CdTe module has a minimal breakage rate. CdTe modules have uniformity color - pure black which provides an excellent appearance, fit best in buildings that have higher standards on appearance, unity and energy-independance.